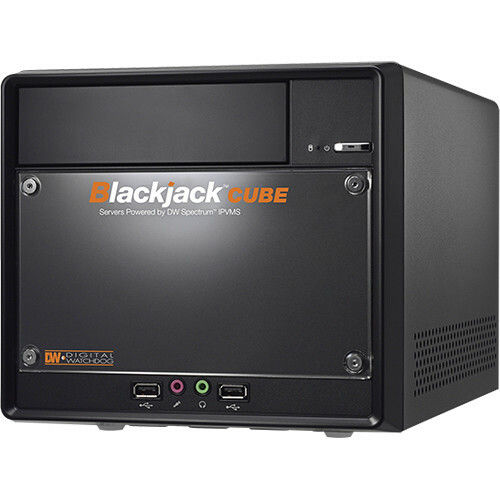 The DW-BJCUBE Windows-Based Blackjack Cube NVR with DW Spectrum Software from Digital Watchdog is a user-friendly video management solution that is optimized to provide scalability, bandwidth savings, and simplified system setup and management. The NVR supports recording from 4 2.1MP IP cameras. The capacity can be expanded to support up to 64 cameras at 30 fps, with 360 Mb/s throughput with additional licenses (available separately). It features 4TB of storage space. The DW spectrum software automatically discovers, populates, and configures cameras on the network. It also allows you to easily drag and drop cameras across servers. The Spyglass feature lets you zoom into any area within a camera’s field-of-view and watch the selected region as a separate display, allowing you to monitor smaller regions of interest separately from the overall camera's image. Fisheye screen de-warping capability allows the NVR to record and display images from a camera with hemispheric lenses. It translates the camera’s feed into multiple viewing formats, including panoramic view. This NVR can be configured to send popup notifications, voice alerts, or an email with the event link for events such as network and storage failure, motion detection, or sensor activation on a camera. The software enables you to track any event through a logging system, which features detailed filtering methods to help you identify a specific problem and exporting options for your personal records. It also allows you to quickly and accurately search for a specific video with calendar and panoramic search options. Supported Cameras Licenses for 4 cameras included. The unit is capable of supporting up to 64 cameras. Additional licenses need to be purchased separately. Box Dimensions (LxWxH) 18.0 x 10.9 x 10.4"